On Thursday night I had a chance to see an advance screening of “Spotlight,” sponsored by Northeastern’s School of Journalism and the College of Arts, Media and Design. And I was blown away. How often does a movie for which you have high expectations actually live up to them? As soon as it was over, Northeastern’s Barry Bluestone said something that I was thinking: this is “All the President’s Men” for a new generation. It is at least as good a piece of filmmaking. And it underscores the vital role that journalism plays in hold powerful institutions to account — in this case the Catholic Church, which at one time was the most powerful Boston institution of all. After the film, five of the Globe journalists portrayed in the film — Walter Robinson, Michael Rezendes, Matt Carroll, Sacha Pfeiffer and Ben Bradlee Jr. — stuck around for a brief discussion. (By the way, I know Robinson fairly well, and Michael Keaton is scary-good at capturing his demeanor.) Two of them, Robinson and Carroll, are Northeastern graduates. Robinson also worked as a journalism professor at Northeastern for seven years before returning to the Globe in 2014. 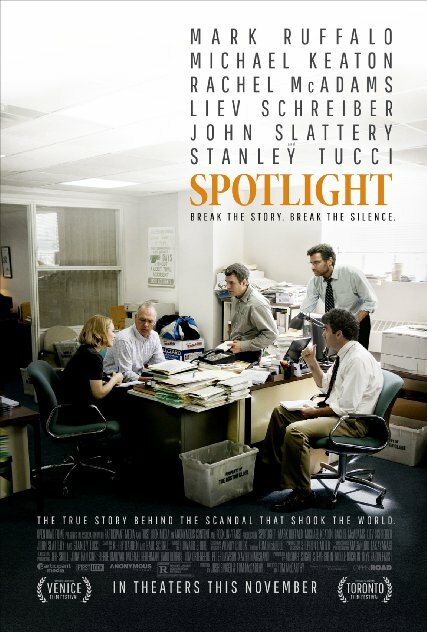 Congratulations to everyone involved in “Spotlight.” I hope it helps the public understand why the work that great journalists do matters to all of us.